The creative output of comedian, writer, director and actor Ricky Gervais is always worthy of some consideration. His past successes with The Office and Extras were due in no small part to his ability to see the everyday banalities of modern life, the petty significance of people’s experiences, and to render them with starkness and a subtly belated pathos. His writing is uncomfortable and angular, he is willing to use silences and particles of speech which seldom reach a script, and the outrageousness of some of his characters is only ever a slight exaggeration. Precisely because of these factors, the release on Netflix of After Life still felt like an important ‘television’ moment. The trailers showed a taciturn Gervais evidently world-worn and life-weary, facing up to the reality of grief, of life after the life of a loved one. The result is at once poignant and polemical, daring and disappointing. As one would expect, the writing and acting is of the first order with a steady naturalism in how things are phrased and delivered. 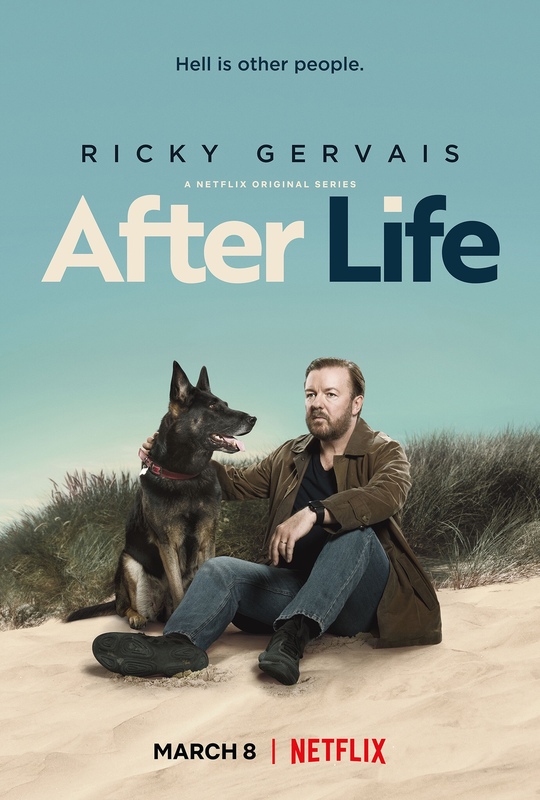 Gervais manages to portray mourning without excessive moping, turning out a brilliantly realised widower who is genuinely struggling to re-order his life in the wake of horrendous loss. The issues of suicide and alcoholism are brutally but sympathetically handled, and the little inflections of frustration with modern life (his character Tony’s encounters with the postman for example) are clever and recognisable. The rest of the cast do a brilliant job, creating a group of people who are part of the main character’s world, but who have excellent and disarming back stories of their own. The pace of the drama is also spot-on, and Gervais’ willingness to plant seeds of his plot which germinate throughout the series is both ambitious and believable. Given Gervais’ status it would have been easy to turn out a comedy series which didn’t take the pains which After Life has done, but there is little sense that he is resting on past capital in the writing and production here. The poignancy of the drama is, however, somewhat thrown out of balance by its polemical preoccupations. Gervais’ atheism is given ample air time (which, as a Christian, is fine by me) but only in environments where it can be affirmed rather than intelligently probed. There are a few easy bouts between Tony and a colleague whose apologetics are somewhat lacking, offering him paragraphs of room to ruminate on the place of Christianity in a pluralistic world and the feasibility of ethical living in the absence of absolutes. In one sense it is refreshing to engage with a drama which enters this territory, but the handling here is neither believable nor deft. This is particularly disappointing given the conceit behind the drama. I would have loved to watch a drama in which an individual works through the realities of grief from the vantage point of an atheistic worldview, where there was some sense of tension or even a small degree of wrestling with what it means to lose someone if the only ‘after life’ is that lived by those who are bereaved. Instead we get a series of monologues straight from the outdated and philosophically unsophisticated playbook of Richard Dawkins. That disappointment is also sustained by some of the context and conclusions which After Life offers. Far from portraying grief in grey or gritty terms, the series’ world is permanently sun-lit and serene. Tony lives in a fictional town which is lightly populated, he works a dead-end job but is obviously affluent, giving the whole sequence of events a dream-like, heavenly feel. This is undoubtedly intentional, but one has to question the creative ambition behind this. Are we being consoled that grieving without God and without future hope is hard but ultimately enlightened? Are we really probing the pain of personal loss by using utopia as a backdrop? The conclusions of the drama are as sunny as the summer bleached pavements on which it unfolds. At the opening of After Life Tony is at war with the world, standing up to opportunist thieves, feeling irked by other people’s eating habits, threatening a school bully with being bludgeoned to death with a hammer, starkly rejecting a date, showing impatience with his elderly father, and knowingly helping someone else to commit suicide. So far, so fearless. But the gradual turn around in Tony’s life is hard to quantify against these earlier behaviours, his empathy for others seeming to be restored through conversations with an elderly widow and a feckless psychotherapist. The resolution to the drama is vacuously redemptive with Tony’s goodness turning around the lives of all who are in his orbit. He resolves to treat others well as a means of grace, reserving his ire only for those who deserve to be handled with contempt. This is all too easy. It is such a shame that a programme which purports to probe grief, which interrogates God, which heralds humanism, is so lacking in self-awareness and auto-critique. Gervais writes as though Beckett never had, as though existential angst is a thing of the past, as though creation simply awaits its redemption through human good. This is desperately naive, and utterly insufficient to face the true realities of living in the rough stuff of a broken world. Gervais does not want God but he longs for good, he does not want absolutes but he does want altruism, he wants to talk about grief but only as a vehicle for humanistic grace. There are depths to loss which are not plumbed here, there are anxieties and contradictions and cross-pressures which plague our existence as human beings, there are deep wounds which cannot be healed lightly, and After Life does little to address or grapple with any of this.